The official US Army MOLLE FLC II, genuine surplus. 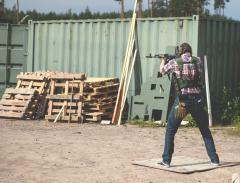 Essentially a modern light combat vest with as much carrying capacity as can be crammed in. Used issue kit. The MOLLE-system consists of a rucksack, a load bearing vest and an assortment of different pouches that can be configured to excel in every situation. Still used by the US armed forces. This is the vest base of said system. The FLC-system is very well designed: the whole thing is covered with PALS-loops, and can be adjusted freely in just about every direction. The materials used are durable and lightweight. A heavy-duty zipper runs in the front, reinforced with fastex quick-release buckles. 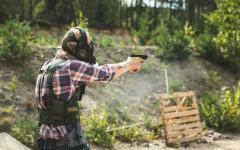 Every serious MOLLE-compatible pouch should fit, as will any ALICE-pouch. 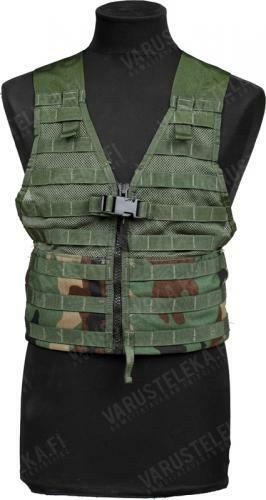 Although the lower part of the vest is camouflaged, any pouches attached will cover it, so the fashion conscious warrior need not to worry about mismatching colours. 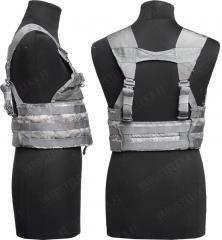 Adjustable for everyone with or without body armour - maximum waist/chest circumference from very small to about 144 cm! The materials are top notch military grade cordura and quality polymer buckles. No corners have been cut with these, and they have NIR properties in order. These vests are more or less used, but in serviceable condition. Originally made in the US, this is quality stuff you can depend on in life-or-death situations.